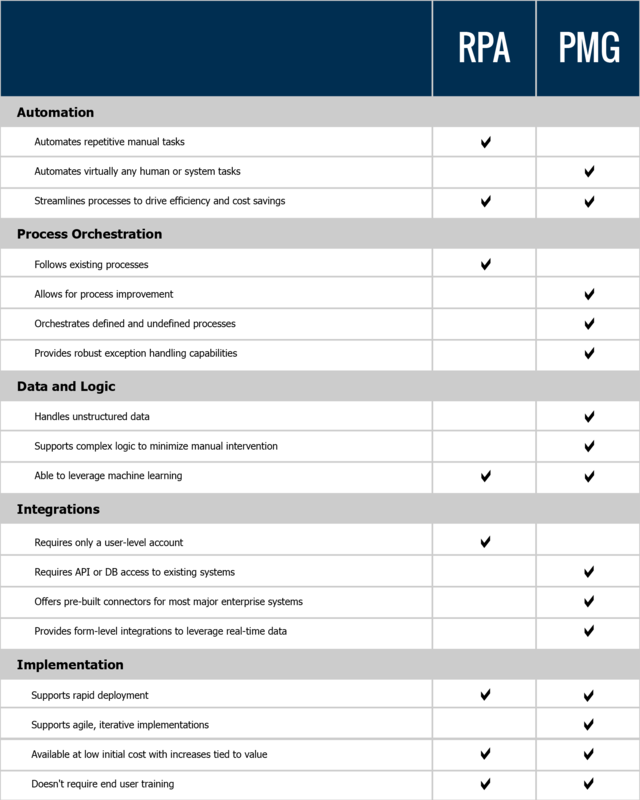 PMG provides the process orchestration, error handling, and integrations you need to get full benefit from RPA. Without process automation, efficiency gains are significantly limited. A manual hand-off means less control over outcomes. Limitations of current OCR technologies, inconsistencies in screen loading times, and other variables mean that bot errors occur regularly. And the manual intervention required to process failed executions is time consuming. Integration with orchestration is the best way to address the challenges found in RPA implementations, and a robust low-code platform offers the solution. Benefits of augmenting RPA with PMG. Maintain fast and easy deployment. One reason why RPA tools are so attractive is their promise of speed and ease in implementation. PMG delivers on that value proposition. PMG’s low-code platform is architected for business users. Workflows are configured with drag-and-drop actions and are deployed at the click of a button. Low-code integrations are achieved with system-specific connectors or generic workflow actions, allowing you to augment your RPA tool without adding complexity. What’s the difference between RPA and PMG?